You can’t shake a stick at your local CX series without hitting somebody that has decided to concentrate on cyclocross because training and racing on the road meant too much time away from the family. Want to hear something crazy? Jonathan Page feels the same way. Granted for him being a pro roadie meant spending weeks, not a day or hours, away from his family, but it’s the same idea. This is not to say that your decision to hang up the road shoes for a focused pursuit of cyclocross means you will soon be standing on the podium of the Elite World Cyclocross Championship like Jonathan did in Hooglede-Gits, Belgium in January 2007. But it does make it that much easier to justify your CX obsession knowing that the United States’ most successful male racer is on the same wavelength. 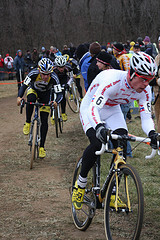 Jonathan is a three-time U.S. Elite Cyclocross champion and the silver medalist at the 2007 World Elite Cyclocross Championship. Despite his dedication to ‘cross, in the off-season he is no slouch on the road, either. A fact illustrated perfectly by his podium finish, while riding for Maryland-based Battley Harley—behind fellow CXer Adam Myerson—at the June 30 Exeter Criterium in New Hampshire. Jonathan will tell you that he is a husband, father and cyclocross racer trying to be the first elite U.S. male to win the World Cyclocross Championship. His motto, “Work hard, race clean,” is put to the test every week during the European CX season as he battles it out with the world’s top ‘crossers. I’ve been a huge Jonathan Page fan for several years and was psyched when he agreed to take time out of his schedule to answer some questions. Here’s what he had to say. CXHairs: Most folks that follow the sport of cyclocross know Jonathan Page. For those still living under rocks, we should probably start with a little background. Were you raised in a cycling family? PAGE: No, not really. My brother raced some at a local level but mostly was a cross country ski racer and coach. CXHairs: When did you start racing and how long did it take you to realize this is something you could pursue as a career? PAGE: I started racing cross in 1995. I tried to turn it into a career starting in 2001 I suppose but didn’t really have a career so to speak until around 2003. CXHairs: How did you come to primarily focus on cyclocross rather than road or mtb? PAGE: I didn’t want to lead the life that many road pros lead. I miss my wife and kids too much when I am gone for just a few days … I can’t imagine for a few weeks. CXHairs: At the height of the European ‘cross season, what does your typical training week look like? PAGE: It depends on the week really! Sometimes I race so much that there is no time for training and sometimes I have the whole week so I do more training. CXHairs: Does it change much when you are racing ‘cross in the U.S.? PAGE: I hardly race cross in the U.S. anymore. Just a few races to start the season and then nationals. CXHairs: Do you train with a power meter? CXHairs: You’ve been doing this awhile and probably have forgotten more about cyclocross than most of us will ever know. With that said, do you work with a coach? CXHairs: What do you think the biggest benefit is? PAGE: He is a calm nice guy that believes in me the way I am. He gives me strength. That’s the biggest benefit. CXHairs: You have a new bike sponsor. So I guess the obvious question is what has Blue done for you? The spy shots of the new ride on Cyclocross Magazine’s look sweet. PAGE: They are my second biggest cash sponsor after planet bike and I have gotten to help design the new bike to be exactly what I want. That will benefit both of us I think. CXHairs: Conventional wisdom seems to be that cross is a spectator sport in Europe and a participant sport in the U.S. Do you think that theory holds true and has it changed at all over the years? What is the amateur cyclocross scene like in Europe? JP winning the Jonathan Page Planet Bike Cup. No pressure there. Photo by Amy Dykema. PAGE: I think that is true if I look at the field sizes and the crowds in Europe versus in the U.S. I am not sure what the amateur scene is like because unlike here in the states, in Europe they are separated, in totally different places, on different days. Mostly I never see the amateurs race. They have a very good racing series for amateurs in Belgium. I know that. CXHairs: What is your favorite European race venue and why? How about U.S. venue? PAGE: I like Koksijde because riding in the sand dunes reminds me of riding in the snow in New Hampshire. I also like Middlekerk because I always seem to do well there and of course, I will always like Hooglede Gits!! Any course in Switzerland is great too because of the scenery and the visit with our good friends our “2nd family” there. In the U.S. I used to like Gloucester when I did it and now I don’t really have a favorite I guess. 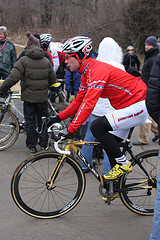 CXHairs: Lots of new and aspiring CX racers read this site. What is the number one piece of advice you would give the new racer? CXHairs: We have a bit of a food fetish, here. What is your pre-race fueling routine? Ever tried a pre-race donut? PAGE: I don’t have any routines really but I do like a nice pb and honey sandwich and espresso. Never tried the pre race donut. Not sure that would end very beautifully. CXHairs: What is your typical pre-race routine for cyclocross? Any rituals or superstitions? Pre-Race kiss from family? Yes. Donut? No. Photo by Amy Dykema. PAGE: If my wife and kids are there, I give them a kiss on the start line. Other than that, I don’t have rituals or superstitions because I have known too many people that do have routines and it’s all fine if it goes well but if one thing goes not quite as planned, they are ruined. CXHairs: How has it been to race with the Battley Harley boys? PAGE: Great! I am really lucky. I’ve made some good friends, namely Russ Langley and Tom Buzas, and Tom, the manager/owner, makes it really easy for me to race in the summer so it’s a lot of fun and really helps me out. CXHairs: Anything else you’d like to mention that I may not have asked? PAGE: Thanks for the interview opportunity. Thanks to everyone for reading! If you are interested in finding out more about what’s on tap for Jonathan there is no more apt place to visit than The Jonathan Page, www.thejonathanpage.com. Special thanks to Amy Dykema for the photos. 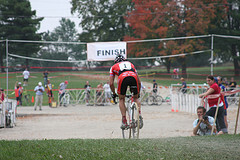 To see an incredible collection of cyclocross photos, visit Amy’s Velogrrl Flickr site. nice one, bill. keep it up. Next Next post: Got Skillz?